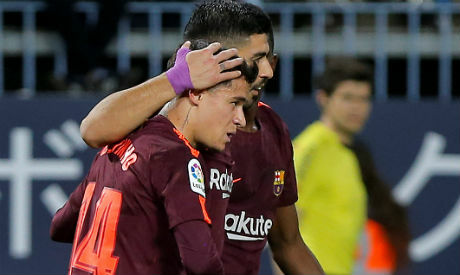 Barcelona overcame the absence of Lionel Messi to win 2-0 at basement club Malaga on Saturday as goals from Luis Suarez and Philippe Coutinho sent the Catalans 11 points clear at the top of La Liga while Real Madrid left it late to win 2-1 at Eibar. Messi missed a league game for the first time this season so he could attend the birth of his third son Ciro. However, Barca barely needed their talisman against freefalling Malaga, who had striker Samu Garcia sent off after half an hour and slumped to a seventh consecutive league defeat. Suarez headed home a looping cross from Jordi Alba to give Barca the lead in the 15th minute and his former Liverpool team mate Coutinho struck the second in the 28th with a backheel from close range after an impressive dribble from Ousmane Dembele. Malaga did manage to create two chances in the first half but they could not test Barca goalkeeper Marc-Andre ter Stegen. Malaga goalkeeper Roberto Jimenez was kept busy at the other end and did well to thwart Paulinho, Samuel Umtiti and Dembele, while Suarez picked up a booking that means he is suspended for Barca's next game against Athletic Bilbao. Barca are still unbeaten in the league and lead the standings with 72 points, 11 clear of Atletico Madrid who host Celta Vigo on Sunday. Real are third on 57 after seeing off dogged Eibar with two strikes from Cristiano Ronaldo.